this looks like a "Take that one home and study it over the weekend"
8/6/2004 11:14:06 AM Mountain G9:: thanks....I'm up 2pts and going fishing....take care,keep up the good work. 8/6/2004 11:09:14 AM Mountain Al:: yes-see my annual forecast in the past issues of the newsletter on Moneytide.com. Awesome computation. 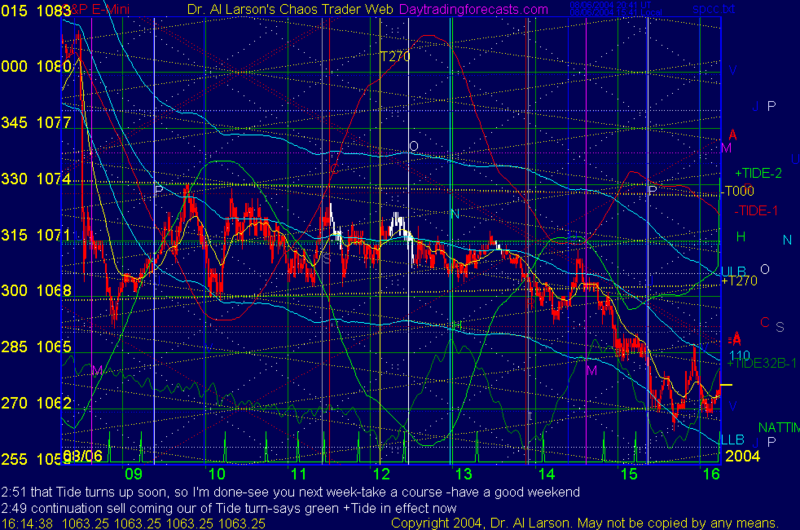 8/6/2004 11:04:50 AM Mountain G9:: Al.....longer term are ya bearish? 8/6/2004 10:20:59 AM Mountain G9:: Great AL........I still stop by on Fridays to see what your up to. I'm still trading my system. 8/6/2004 9:55:18 AM Mountain Al:: just us chickens G9 - how have you been? 8/6/2004 9:52:34 AM Mountain G9:: Anyone else here? 8/6/2004 7:30:36 AM Mountain BJM:: The charts are not updating. 8/6/2004 7:29:08 AM Mountain Al:: The chat room is open to everyone today. I will monitor it as best I can. Any comments on the new courses and rhe reader will be appreciated. Some of you trying the reader have helped me find one bug already. Thanks.